Sabiha Sumar provides a fresh and insightful perspective on Pakistan in this finely crafted personal film. Beginning with the creation of Pakistan in 1947, Sumar traces the relationship of Islam to the state in an effort to understand how women are coping with and surviving the increasing religiosity of civil and political life in their country. 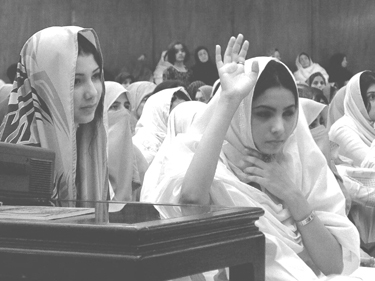 Juxtaposing interviews with Pakistani women who have chosen to veil themselves, even in the absence of any state directive to do so, with observations from her feminist colleagues who cling to hope for a more secular system, Sumar dramatically captures the tension between liberal and fundamentalist forces that are shaping life in contemporary Pakistan. Chilling footage of a mother encouraging her toddler to be a martyr when he grows up, home movies from Sumar’s childhood and the filmmaker’s cogent political analysis are lyrically combined to create a timely and compelling document—pulling together the strands of belief, reinterpretation and reform in Islam. Sabiha Sumar is the only independent film director in Pakistan. She studied film at Sarah Lawrence College, New York and has since been making films on social, political and environmental issues. Her films "Who Will Cast the First Stone", "Karachi" and "Where Peacocks Dance" have been aired on Channel Four, UK and "Of Mothers, Mice and Saints" was produced for ZDF, Germany. Her work has been shown at the London and Rotterdam Film Festivals. Most of her films cannot be shown in Pakistan.